On 7- 10 October 2014, the Global Agenda held the fifth Multi-stakeholder platform (MSP) meeting in Cali, Colombia. 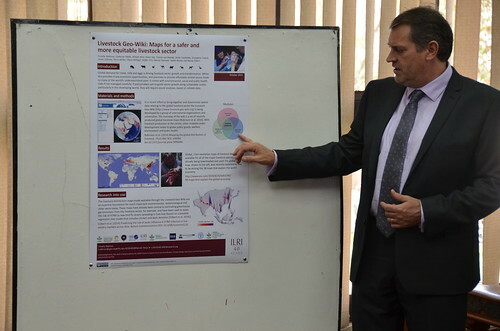 Tim Robinson, a senior spatial analyst and statistician at ILRI participated in the meeting in which he delivered two presentations focusing on the Global Research Alliance on agricultural greenhouse gases (GRA), an animal health and greenhouse gas emissions intensity network and on the Livestock Geo-Wiki’s manure management module. On the one hand, the GRA brings together researchers to investigate links and synergies between efforts to reduce livestock disease and GHG emissions intensity reductions; and on the other hand, the Livestock Geo-Wiki was created to provide reliable data and information on global distribution and abundance of livestock. The Livestock Geo-Wiki gives data on livestock densities, livestock production and production systems, feed resources and rations. ILRI is an active member in both platforms where it carries out the research mandate in the GRA and carries out modelling of livestock distribution, production distribution and herd/production for the Livestock Geo-Wiki. Read more about the Livestock Geo-Wiki from a previous ILRI blog post. Tags: Global Agenda for Sustainable Livestock, Tim Robinson. Bookmark the permalink.